The attempt to secure a “meaningful vote” that could have potentially given MPs the power to stop Britain leaving the EU without a deal has been defeated. The final obstacle to the EU withdrawal bill was removed as MPs voted 303 to 319 against an amendment tabled by the former attorney general Dominic Grieve – before he accepted government reassurances about its respect for the power of MPs to hold it to account. Grieve said a compromise was the best way to make progress. We’ve managed to reach a compromise without breaking the government – and I think some people don’t realise we were getting quite close to that. I completely respect the view of my colleagues who disagree, but if we can compromise we can achieve more. At least six Tory rebels – Ken Clarke, Sarah Wollaston, Anna Soubry, Heidi Allen, Antoinette Sandbach and Philip Lee, who resigned last week to vote against the government – held out against the compromise that Labour MPs dismissed as meaningless. The compromise was reached as David Davis, the Brexit secretary, tabled a written statement recognising the authority of MPs to hold the government to account, and saying that it would be for the Speaker to decide at the time whether any government motion could be amended. The government proposal would have ruled out amendment altogether. This is a disappointing result and comes after Theresa May is forced once again to try to buy off her own MPs at the eleventh hour. The tight vote meant MPs came through the voting lobbies in wheelchairs, and at least two heavily pregnant. The scenes have caused many to call for reform of voting procedures. Separately, the government has apologised to relatives of hospital patients who died as a result of being given life-shortening opioid drugs without medical justification and said criminal charges could follow. 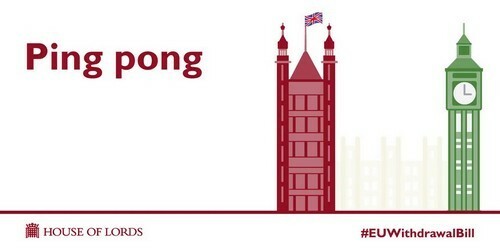 A Labour source said they expected no further “ping pong” between the Lords and the Commons when the bill returns to the upper house tonight. They expect proceedings to be wrapped up by 8pm, probably without a vote. The Lords *will* consider the EU Withdrawal bill again tonight, but by convention they are unlikely to send it back to the Commons again. It will mean the bill has passed its final hurdle before receiving Royal Assent. That’s all from me, but my colleague Kevin Rawlinson is taking over this evening. There was some quite heavy briefing this morning that Labour Eurosceptics and Labour MPs with leave-leaning seats could be the ones to deliver the government victory tonight, by rebelling against their party and voting against the amendment. Labour whips say they are pleased tonight that only four Labour MPs did so, all of them long-standing Brexiters. I’m told Denis Skinner, a fervent Eurosceptic but a long-standing friend and ally of Jeremy Corbyn, helped carry many waverers over the line. But Labour are clearly frustrated that a win was possible but Grieve’s concession meant it was denied. There were some unedifying scenes in the Commons today as some sick and some heavily pregnant MPs had to go through the lobbies. My colleague Peter Walker has these details. One of the effects of both the vote and the decision of the government to not allow MPs’ votes to be counted merely by their presence in parliament saw curious scenes in the corridor adjoining the lobby outside the Commons. Labour MP Naz Shah was taken through in a wheelchair – she has been in hospital with severe back pain – while Laura Pidcock, her heavily-pregnant colleague, walked out from the vote and was helped away in another wheelchair. Jo Swinson, the Lib Dem deputy leader, who is two days past her birth due date, managed the walk unaided. The complications come from the fact that while MPs can be “paired” – if they are absent an opposing MP will also not vote – there is not as yet a system for proxy votes, something the Labour MP Harriet Harman has been campaigning for. There is quite a bit of anger about this from pundits and MPs. The BBC’s Laura Kuenssberg says she thinks the government should be worried by how tight the vote was, even after the compromise was struck with Grieve. Labour’s shadow Brexit secretary Keir Starmer has reacted to the result. There is clearly a lot of frustration on the Labour benches that a win against the government was possible. Labour has long argued that Parliament should have a proper role in the Brexit negotiations and a meaningful vote on the terms upon which we leave the European Union. We will continue to make that argument and press our case at every opportunity. Leading Tory Brexiter John Redwood said he was “very satisfied” with the result. “I never rashly doubted we would win, as otherwise it would frustrate the will of the British people,” he said. It is a cruel irony that many of those making the amendments are of the generation of politicians who gave away so many powers to Brussels. And now it seems their main aim is to stop us from getting back those powers. Dominic Grieve voted against his own amendment, but six Tories voted in favour, including Philip Lee, the former justice minister who resigned in protest of the government’s Brexit strategy. Missing are several MPs who have been outspoken on Brexit, including Nicky Morgan, Stephen Hammond, Bob Neill and Jonathan Djanogly. Labour whips will be pleased that they have limited their rebels to just four. There may be some significant abstentions too, which we’ll get shortly. Dominic Grieve has spoken to my colleague Peter Walker after the result of the vote. He says he believes reaching a compromise was the right solution, even if some of his allies disagreed. We’ve managed to reach a compromise without breaking the government – and I think some people don’t realise we were getting quite close to that. I completely respect the view of my colleagues who disagree, but if we can compromise we can achieve more. The Lords amendment, drafted by Dominic Grieve, is defeated, after that last minute concession. The government won by 16 votes – it will be interesting when we get the final stats about which Tory rebels rebelled, and which Labour MPs joined them. Liberal Democrat Brexit spokesman Tom Brake has seized on the ‘Grand Old Duke of York’ nickname. Just like the Grand Old Duke of York, Grieve has marched his troops to the top of the hill only to get cold feet and retreat with his tail between his legs. Despite the clear calamity that May and Davis are making of Brexit, the so-called Tory rebels have lost their bottle and caved into yet another pathetic government compromise that isn’t worth the paper it is written on. There are potentially far more significant battles to come on a raft of bills, including the trade bill and customs bill, where many Tory MPs have put their names to amendments on a future customs union. But the “meaningful vote” is probably the least controversial issue so it does not bode well for the success of those amendments. It seems like Labour MPs were forced to make it into Parliament from their sick beds, as was raised in the chamber in a point of order earlier. This from the Times’ Sam Coates. I’ve just seen a Labour MP in a wheelchair with a paper sick bucket looking in lots of pain after voting (because Tories refused MPs who r ill to vote from the car park). It was quite a sad sight. We expect the result in a few minutes. The government is now expected to win comfortably. ITV’s Robert Peston has an explanation of sorts from one of the Tory would-be rebels. In essence, they believe there will always be a way to force a vote. The EU Withdrawal bill will need to go back to the Lords one final time, but we don’t expect the Lords to send it back again, meaning the legislation will finally pass. It may be as early as tonight.